The incident occurred during a sweep of a firing range to clear unexploded ordnance, a Marine official said. 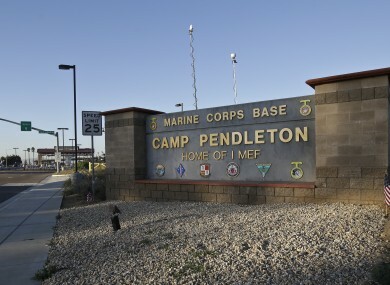 The main gate of Camp Pendleton. FOUR US MARINES have died during an operation to clear a range of unexploded ordnance at a military camp in California. The deaths occurred yesterday at Camp Pendleton during a periodic sweep of explosive material to make ranges safe for future exercises, a Marine official who spoke on condition of anonymity said. There was no live firing on the range at the time, they said. The identities of the dead were withheld pending notification of relatives. Base officials released no details on the accident. Authorities are currently investigating the cause. “We offer our heartfelt prayers and condolences to the families of the Marines lost today in this tragic accident,” said Brig. Gen. John W. Bullard, commanding general of Marine Corps Installations West at Marine Corps Base Camp Pendleton. Our first priority is to provide the families with the support they need during this difficult time. A military investigation determined human error was to blame for that accident. According to the probe’s findings, a Marine operating a 60 mm mortar tube and ammunition did not follow correct procedures, resulting in the detonation of a high explosive round at the mortar position. Email “Four US marines killed in incident at military base”. Feedback on “Four US marines killed in incident at military base”.